Betting is the singe most important thing that you will have to learn, when you want to play poker. There are many different times that you will have to pick which bet that you will use. 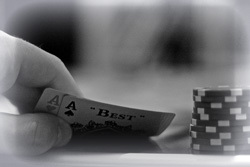 The holdem poker forum contains all the info you need to know about it. When you are placing a bet you need to be careful, and know which bet that will benefit your hand the best. To be able to do so you will have to understand the way that each bet works and what they are called. You will learn to be able to call the appropriate bet, and be secure in the choice that you have made. I will help you to be able to recognize the bets that you can use in the poker games, and tell you when you will have to use them at the right times, in the poker online games. This will give you the incite, that you need to play. Let’s jump right in with the learning process shall we. When you are placed at the poker table you will be in the seat that you are in till you are broke, or declared the winner. You will see a dealer button in front of one player at the table. This is the player that has the right to act last in that hand. After the seats are full, and the game starts the first player to act will be the one to the left of the dealer button. There is a single round of betting once the dealer has dealt the cards. Each player will look at their cards and make a bet. The possible bets that they can make are to fold, check, or rise. If you are dealt a hand that is suited or paired, then you are probably going to want to raise the other players at this point in the game. After the initial round of betting is over and you are now in or out of the play, the dealer will turn three cards face up on the table; this play is called the flop. After the flop each player will again face a round of betting. Look closely at your hand and once again think about the choices that you have. Most people at this point need to have at least flopped a pair, to stay in the hand. If you have a straight draw or a flush draw, then you may want to try to check, and stay in for the next round. If you are looking at a hand that is dead, then you should probably fold gracefully. Next the dealer will proceed and turn over one card. The round is known as the turn. It can also be the turn in your hand that you need. If you were lucky and got the card that you needed to complete your hand, then you can use the raise to increase the pot that you are looking to win. Be careful though, because you want to make sure that you raise low enough that the other players will call so that you can maximize your winnings. If you are betting more than the pot is worth, you might cause the others to fold. After the bets are made for the turn you will watch, as the dealer reveals the final card in the hand. This card is known to players as the river card. When the river card is turned face up on the table their will then be one last round of betting. This is it; you have to make your final decision for the hand. Depending on the worth of your hand, and you chances of being able to win the pot, you can choose to check into the other players, and make them raise you, or you can choose to be the aggressor, and raise the pot yourself. In a no limit poker game, this is the point that players that are looking at a top pair or flush, love to go all in. If you think that your hand is the best then you should call their bet. Sometimes you will overlook something that can cause you to lose the hand, but if you are careful and study the cards.